September 9, 2017—-Resources used to sustain people includes a variety of elements in the environment. Some sort of resource depletion occurs in almost all types of environments. 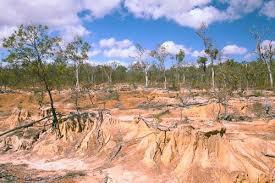 Land degradation has become widespread. Degradation can take many forms. Among these are erosion by water, erosion by wind, and chemical degradation. On a global basis erosion by water accounts for over 50% of total land degradation. Wind erosion accounts for another 30%, and chemical degradation the rest. Soil Erosion is devastating to food growth. Soil has been the basis in agriculture for thousands of years. Some of the most valuable land on the planet consists of land with the best soil for growing crops. Soil erosion consists of the removal of soil material, the transportation and deposition of the material. Soil erosion is widespread. In some areas the erosion has been, and is so bad the land is no longer usable for agriculture. 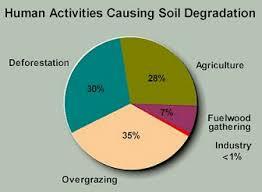 In grasslands, where most intensive agriculture takes place, soil erosion is widespread. In the drier parts of the grasslands overgrazing is common. Desertification often results. This is the reduction of the land to essentially desert conditions. 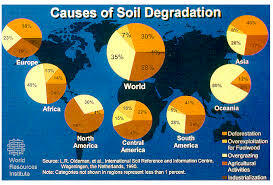 Land degradation effects food production. Deforestation is another example of resource depletion. Vast areas of the tropical rainforest are disappearing rapidly. It is being cleared for agriculture primarily. The huge band of forest in the sub-Arctic is also disappearing. In this case the timber is being cut for lumber. With the loss of the forest cover, soil erosion becomes pervasive. These forests are important to the climate of Earth as well as a means of livelihood for people. Once these resources are reduced or eliminated, overpopulation inevitably results. Of the water on the planet, almost all of it is salt water (97.5%) found in the global ocean. Only about 0.5% exists as fresh water in the rivers and lakes on the land masses. The remaining 2% exists as ice in the polar ice caps and mountain glaciers. The rivers on the planet are extensively degraded due to agricultural and industrial chemicals, urban runoff and human waste. The addition of chemicals and organic matter entering the oceans is changing the chemistry of the water especially in estuaries. Resource depletion is a substantial factor in growing overpopulation and the need to limit growth. Even without a growing population, resource depletion is, and will continue, to lower the carrying capacity of the planet. Resource depletion joins population growth, and declining human health as crucial global trends that are now catastrophic in some regions. Don’t let profit prohibit the drive for action that will prevent further destruction of our planet! Categories: Climate Change, Pollution, Population, Sustainable Education | Tags: #climatechange, #resourcedepletion, Population growth | Permalink.